Take a break for a minute, unglue yourself from the screen and look out of the window. What do you see out there? February. All the holiday lights and cracker confetti have disappeared from the streets a long time ago, but we still have one present for you to deliver. It’s our traditional digest of the top January e-Commerce articles.Now take a seat in your comfortable chair and enjoy the list of most interesting January articles we prepared for you. Many inexperienced entrepreneurs are often too passionate about their startups and fail to determine what is the concept, idea and aim of their e-Commerce store. These basic questions need to have their answers to become a foundation of profitable e-business. You might start writing them down right after reading 14 Questions Before You Launch an Ecommerce Site. Even if you’re already an e-store owner, don’t neglect them - check yourself. Why do people say “Google it” but not “Yahoo it” or “Bing it”? Because of an extremely effective brand strategy of Google Inc., that made the word “google” a synonym to “search”.Wondering what is the trick that could establish your own e-Commerce brand as well? The article 5 Brand Strategies to Uniquely Position Your Ecommerce Business Above the Competition might help you to answer this question. Ok, you’ve established your brand. What’s next? Now make customers love it! Doesn’t sound like an easy task, but absolutely real with the right strategy of seduction. Take a look at Customer Seduction: How to make customers LOVE your brand [Infographic] and discover the secrets of customer loyalty. If you decided to open an online store after all, or already have one, then you must have heard about SEO and its importance for revenue. Every successful entrepreneur tries to optimize his website to reach the first line in Google, and so should you. That is the reason we recommend you to take a look at 10 Best Practices for an SEO-Savvy Ecommerce Store. We all need some changes once a while, as changes bring progress and progress - is a key to success. What to do, if you’ve decided to move on and redesign your website or migrate to another platform, but afraid about SEO? No worries, you just need some little preparation to make before pushing a “Launch” button. SEO for Ecommerce Website Redesign article has all the needed information for you to make the redesign or migration smooth and stressless. Hint: By the way, talking about the migration. If you’re willing to change an e-Commerce platform, but not sure how to do it, try out free Demo Migration with Cart2Cart. Being poetic, we could say that e-business without marketing is like an unpolished diamond - something quite inconspicuous and barely noticeable among other pieces of coil. To make it shine and sparkle you need to polish it - implement all possible marketing tricks you know. But before grabbing your instruments, study out The State of Digital Marketing in 2015 [Infographic] to get the latest information on internet marketing trends. One of the marketing branches that stood the test of time is email marketing - an effective way to grow e-Commerce business. The point of it lies in collecting email addresses, building communities and converting those “members” into loyal customers. But what if you still don’t have a subscriber list? Then it’s about time to work it out. We present you Five Ways E-commerce Sites Can Collect Subscribers - simple and demonstrative suggestions you need to take a note of. Landing pages are single web pages that appear in response to clicking on a SEO search result or an online ad. They’re designed to convert visitors into customers. However, very often they irritate people instead of making them purchase. Why is it so? Usually, because of wrong planning. Read How Not to Commit This Awful Landing Page Error article in order not to make one common paid search mistake. Eventually, after all the work done to make your e-store successful, you have to protect it. In the age of the internet, burglars can not only break into our houses, but into our computers as well. That is why awareness and preventive measures are important to secure your e-business from digital attacks, hacking and phishing. Here are 6 Tips to Protect Your Online Store from Fraud and Digital Threats that will save you from becoming a victim of cyber criminals. 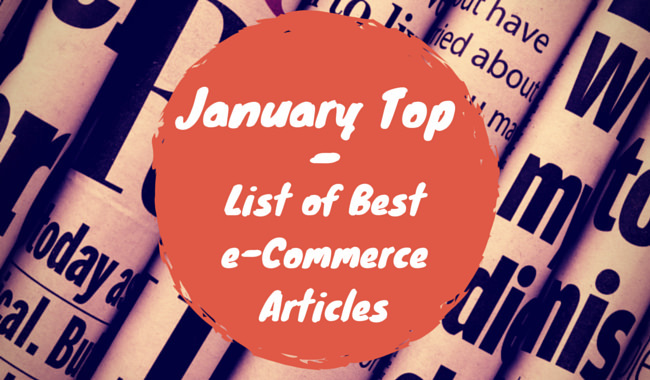 That is the list of the best January articles that will help you to achieve new heights in sphere of e-Commerce. If you have any other suggestions or something useful to share, feel free to write them in the comments below.